This is the fifth and final reclining pose we will have for a while. The challenge of reclining poses is their compact horizontality. How to resolve the space around the figure is the problem. This beautiful model lay on pillows and shear fabric. 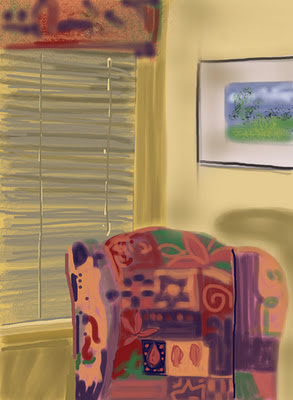 When I painted the sheer fabric with a hint of the pillows under it it reminded me of water. Then the surface of the model stand was painted to resemble water surrounding her as if she was on an island outcrop. Then I thought to continue the water theme by placing a horizon line behind her with a suggestion of water or land or whatever the viewer might conclude. The ambiguity of it appealed to me. The lonely, featureless aspect also interested me. I have the feeling there is something more important going on here that may go beyond technical concerns or the exercise in invention. I just have to think about it more. Stay tuned. This lady was waiting in the same spot as the lady from the previous post. This is all I could catch before her car was ready and she left. The auto dealer’s waiting room has free wi-fi so you can surf the internet while you are waiting for you car to be serviced. That’s kind of nice! Though an iPad is a new toy for me and I can make sketches with it, I prefer to have my low-tech sketchbook with me and draw with more traditional materials. All the high-tech stuff can be great when it works well. It seems that I am still more drawn to centuries-old means of recording images. The touch is not the same with the iPad. As flawless as the iPad is, I still have the sense my drawings are mediated by the technology. I have a stylus for drawing because my finger will obscure the exact position I want to touch. The stylus is not much finer but it allows me to see where a mark will go more easily. A ballpoint pen and paper just seems better. Of course there is no erasing with a pen but I think the ability to easily erase is a stumbling block to drawing. 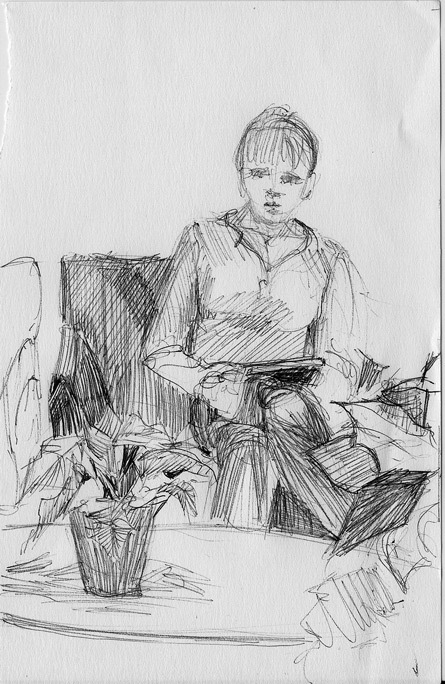 Better to make correction right on the paper so as not to inhibit the rhythm of the drawing process. 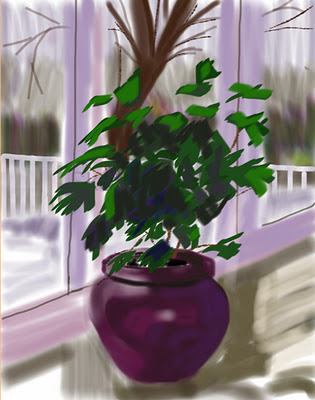 David Hockney has been making a big splash with iPad drawings. And they are beautiful. I guess I just need to practice more. Since I have been on winter break, I have been taking care of things that need to be done. These are the things that get put off while I am busy teaching. I had to take me car in for an oil change and, as usual, while I waited, I made drawings of some of the people who were also waiting. 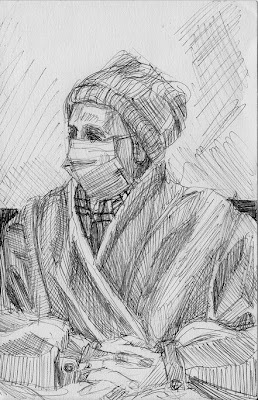 This lady came in all bundled up with her face covered by a surgical mask. I don’t know why. 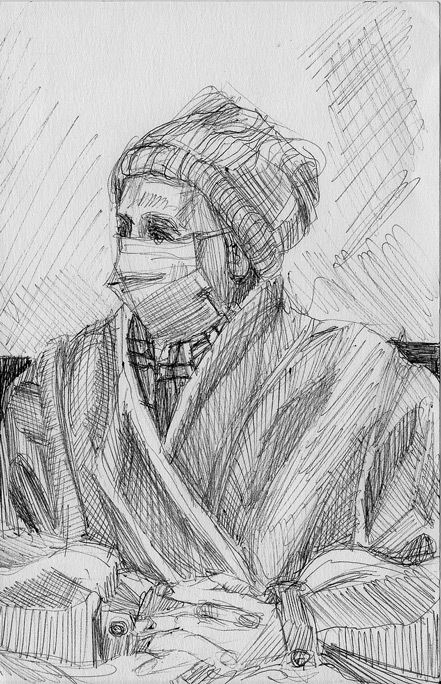 She gave the impression she had a cold and she was covering herself to keep from spreading it. If so, I appreciate her conscientiousness. She may also be one of those people with a compromised immune system. Whatever the reason, she made a good model for my drawing. 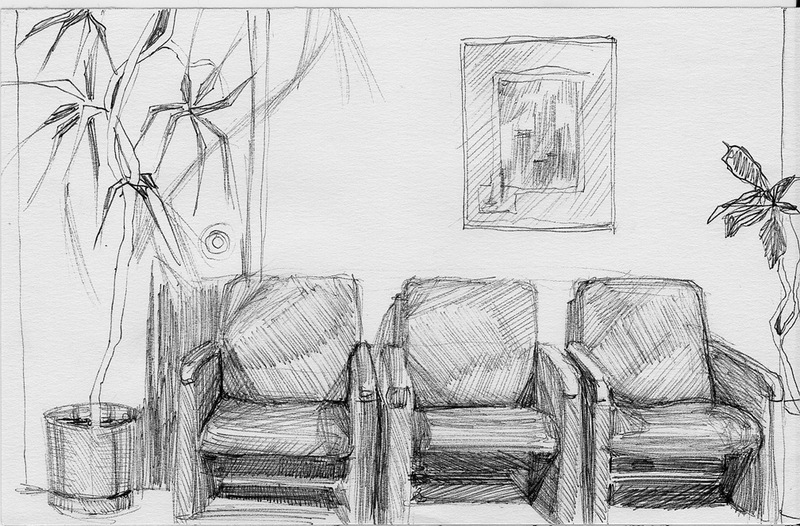 The auto dealer had a television in the waiting room which she watched intently. That distraction kept her quite still for me. I was even able to draw her hands with interlaced fingers with some accuracy. I usually end up with twelve fingers when hands are posed that way. The complexity makes it very difficult to tease out all the relationships when the hands are interlaced and time is short. 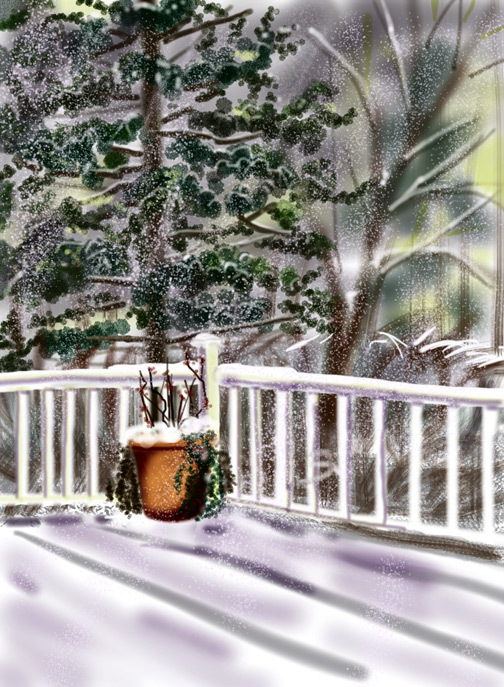 I know I have been singing the praises of my iPad drawing apps but it can’t match the touch of a drawing tool on paper. I can’t do massed line drawings like this on the iPad. The precision of a sharp pointed ball point pen is just not there. 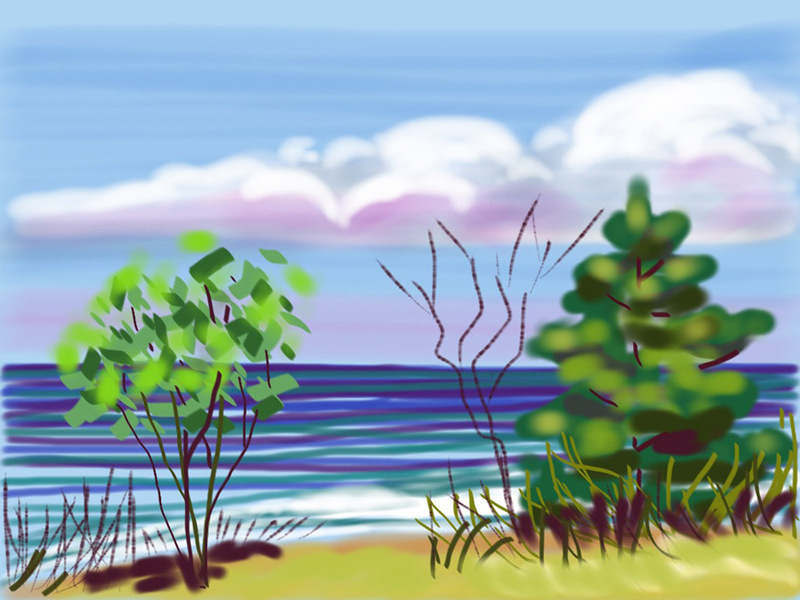 I know the iPad drawing mavens will jump on me for that statement but right now it’s my truth of the matter. Maybe I just need more practice. Once again I was in the dentist’s office waiting for my mother to complete and emergency visit to repair a fractured filling. This helped pass the time. There is just something evocative about chairs. They are stand-ins for people. They have arms and legs, backs and seats. They can be as varied as people and as ubiquitous as people too. 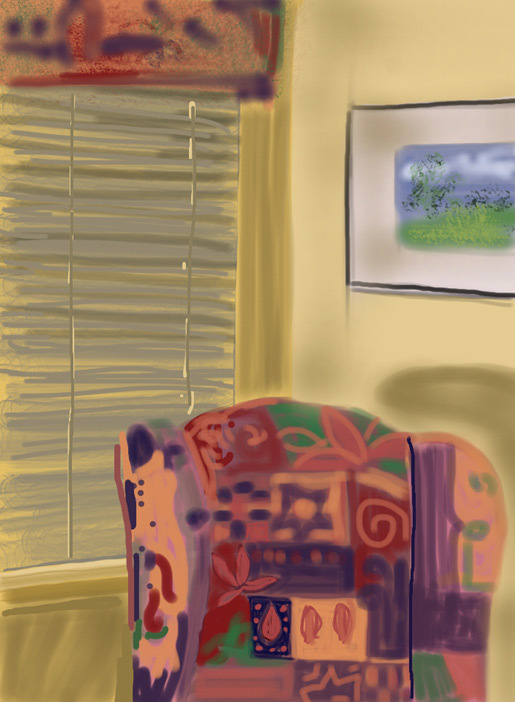 I have been drawing and painting chairs for years. Whenever I am at a loss for subject matter I go back to them. They always deliver. 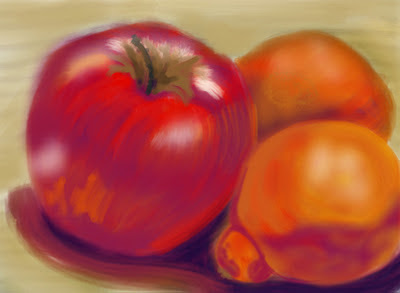 This my last oil painting of 2011. Oil painting is the specifier. The last two paintings posted were watercolors. The model is reclining on a table cloth that belonged to my mother. It is only card table sized but I have made it much larger than it actually is by having it cascade across the background. I then placed everything on a night time Lake Michigan beach. It is almost pure fantasy. Reclining poses are a challenge in several ways: foreshortening is always an issue; resolving the entire space containing a compact horizontal figure is another. Making stuff up solves the latter while pure struggle solves the former. My mother’s table cloth was an inspiration. It helped a lot with the still very saturated colors of its flower pattern. I had placed a deep blue ground into the upper part of the painting just to kill all that daunting white of the canvas. That was for the first session. Then I created the cascade in the second session. The paint was dry which allowed for the application of all that white without it getting contaminated by the background blue.